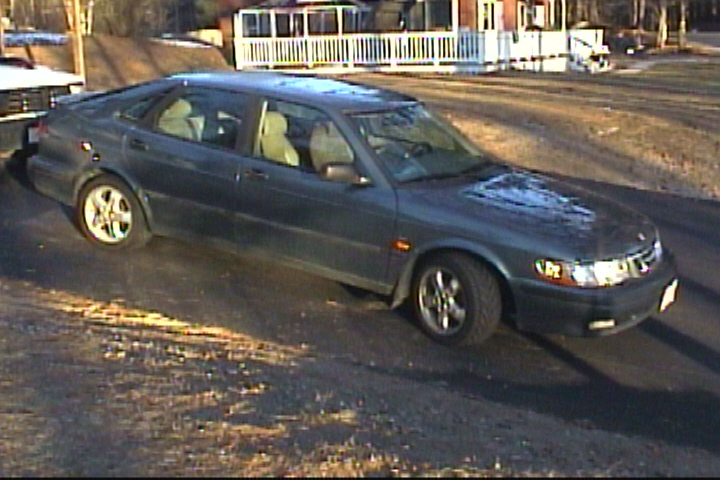 1998 and newer saab 93. Brand new - still in packaging. Ordered the wrong part - too late to return it. 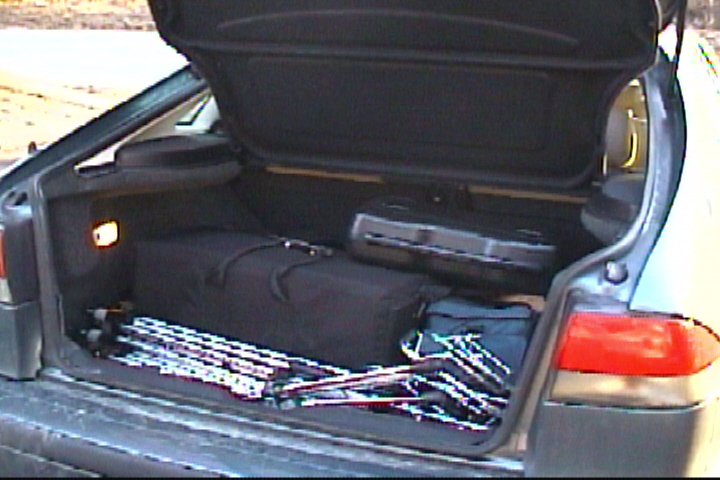 Roominess of a 4 door hatchback. The turbocharged 2.0 liter engine offers the power of an 8 cylinder and the economy of a 4 cylinder. the beginning to the end of the car buying process. The 1999 Saab 9-3 SE has that solid feel that German and Swedish cars are known for. Fit and finish are very good, as is the quality of materials. The leather and plastics on the seats, doors and dash all have a look and feel of quality. There are also plenty of cubbyholes and compartments for storing small items inside the car. The 6-speaker am/fm stereo with cassette, while not dazzling, is certainly more than adequate. Ergonomics and seating position are very good. We feel comfortable in the car and everything is where it should be. Styling is very nice. Tasteful and attractive without making a spectacle of itself. Acceleration is very good. The turbocharger really makes this car come alive! I had a chance to drive a 1999 Saab 9-3 SE with an automatic transmission before buying a 1999 Saab 9-3 SE with a 5 speed. The automatic transmission works nicely and has useful features such as a sport mode and a winter mode. However, it is not possible to wring torque and acceleration out of the 2.0 liter turbocharged 4 cylinder with automatic transmission the way you can with a 5 speed transmission. 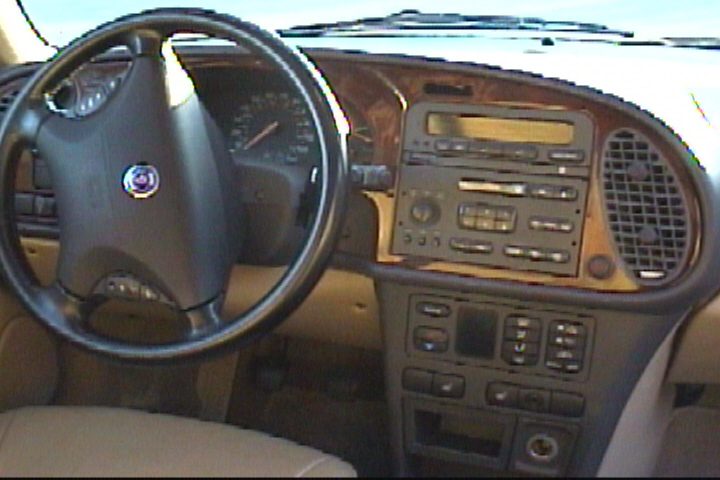 The 5 speed turns the 1999 Saab 9-3 SE into a sports car with a claimed 0-60 time of 7.5 seconds. Handling is very good as far as cornering is concerned, and the 1999 Saab 9-3 SE feels very stable and sure-footed. I do find that the car wants to drift ever so slightly in one direction or another. On the highway, it always seems that it takes an effort (however slight) to keep the car tracking in a straight line. While this is fairly subtle, it does become annoying after an hour or so of driving. Perhaps the alignment is a little off. Since I could not immediately get the car to an alignment shop, I decided to check the air pressure in each of the tires. The pressure was 30 lbs in each tire. A quick look in the owner’s manual informed me that depending upon how you have the car loaded, Saab recommends having between 33 and 41 lbs in each tire. I have always kept the tires of my previous Volkswagens inflated to 40 lbs (yes, I like them on the firm side), so I decided to try the same with the Saab 9-3. This made an enormous difference in the personality of the car! There is still an ever so slight pull to the left, but the car feels much more stable and at ease on the highway as well as on winding country roads. Turns out the car had a worn front stancion arm and bushing. In my quest to replace this, I ordered the worng part and waited too long to return it. The incorrectly ordered item is now for sale at the top of this page. I have since ordered the correct part and will have it installed soon. It should resolve the problem. It is important to note that I have been driving the car with this problem for almost a year. I find that if I keep the tires inflated to 40 PSI, the shimmy is barely noticable. If the PSI in the front tires falls below 36, the shimmy comes alive! Shifting from 1st to 2nd gear during hard acceleration can be jerky. Car wants to wander on the highway and pulls to the right under moderate braking. - this is due to a worn bushing /stanchion arm on the front drivers side that needs to be replaced. Once this is replaced, this should no longer be an issue. We are going to document these aftermarket improvements on video and will be available on a video CD that will play in most DVD players as well as in “Windows Media Player” on most personal computers. This video will be approximately 1 hour long and available for only $10.00 postage paid (in the U.S.) by January of 2004. Click the PayPal button below to reserve your copy now. Stereo, speaker and amplifier upgrade. Fog lights and driving lights. Adjustable shock absorber and spring kit. Improve performance and handling, as well as the overall pleasure of the driving experience with engine, suspension, stereo and electronics upgrades. Any performance upgrades should also increase gas mileage. Any suspension upgrades should improve handling, but without making the car so stiff and rigid that it is no longer pleasurable to drive on a daily basis. Our hope is that an adjustable suspension system will offer both sporting and daily driving characteristics. Any upgrades to the stereo and other electronics must be discreet, fitting into stock enclosures to deter theft and not take up valuable cargo space in the interior of the vehicle. No modifications will be visible from the exterior of the car. This is to be a “sleeper car” – it is not our intent to attract thieves or law enforcement. Also, we like the styling of the car just the way it is. It is not our goal to make a visual statement with the car. As mentioned earlier, every step of this project will be documented on video and available to anyone who would like to view it. We are in the process of obtaining the items mentioned above and the project will begin very soon. Please check this page often, as we will document our progress on this web page and we will be sure to include links to the manufacturers and installers who are involved in this project! Click the PayPal button below to reserve your copy now. Saab updated the 900 series with the name 9-3 for 1999, available as a cabriolet, a 2 door coupe or a 4 door hatchback. The 1999 Saab 9-3 is shares a platform with the General Motors Opel Calibra/Vector, a popular automobile in Europe. The 1999 Saab 9-3 features an improved headliner which proves more padding and increased protection in the event of a collision. The turbocharged 2.0 liter Saab 9-3 has an output of 185 horsepower, with the exception of the 9-3 SE 5 speed, which has an output of 200 horsepower. 5 speed models feature a numerically higher axle ratio (4.05-to-1) for better off the line acceleration. The 1999 Saab 9-3 boasts a wide power band, with 209 lb ft of torque beginning at only 2,300 rpm, continuing all the way up to 4,600 rpm. The 1999 Saab 9-3 features a redesigned low inertia turbocharger which helps to reduce turbo lag and toque steer. Fuel efficiency ranges from 19 mpg to 21 mpg depending upon driving style. The 1999 Saab 9-3 features a hydraulic self adjusting clutch system. 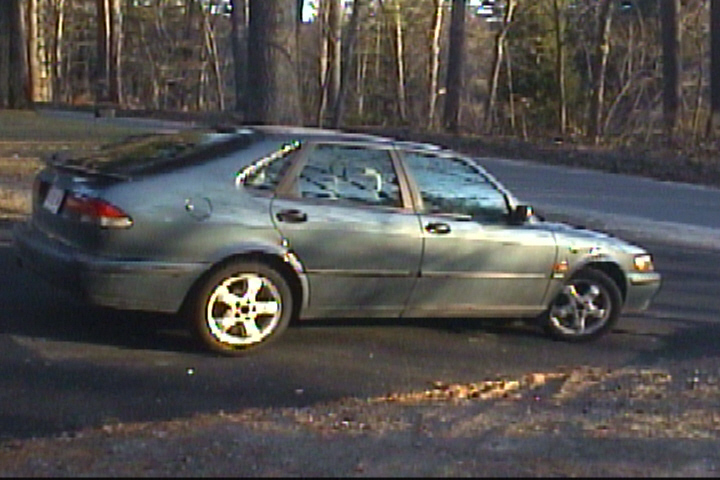 The 1999 Saab 9-3 SE features five spoke 16 inch alloy wheels. The 1999 Saab 9-3 features Saab’s patented pendulum design B-pillar which is designed to deflect the force of a side impact away from the head and chest area of the occupants. The 1999 Saab 9-3 is fitted with the world’s first head restraint system designed to minimize whiplash and work in conjunction with front and side airbags. The high mounted tail light now uses LED’s for enhanced visibility. 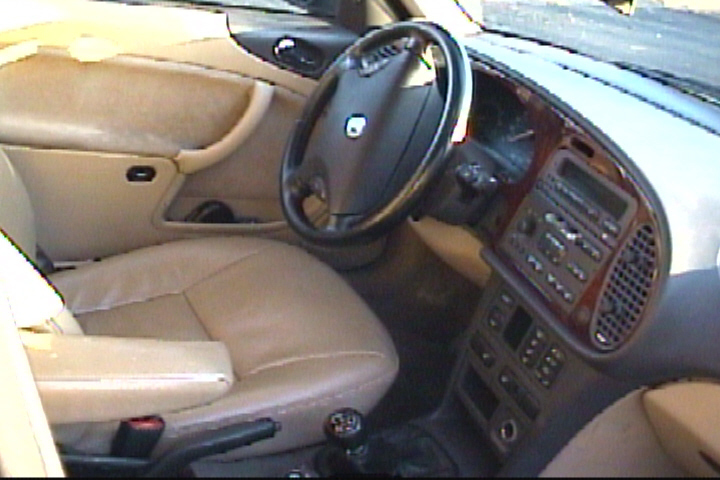 The 2 most often asked questions about this car are: why is the ignition in between the seats instead of on the dash? And: What is the purpose of the “Black Panel” feature which disables all of the dash lights except for the speedometer. The answer to the first question is because back in the early days, people involved in head-on collisions with Saab’s often sustained serious knee injuries because the right knee would be forced into the key on the dash in an impact. Mounting the ignition on the floor eliminated this problem. The reason for the &# 8220;Black Panel” is to reduce eye fatigue on long drives at nighttime. Be sure to visit our Saab 9-3 forum! as well as comments and advice about mechanical issues.